This woman working for Dowless told local Channel 9 that she was paid $75 to $100 per week and was instructed to gather ballots and give them to the campaign, not mail them to the state. Consistently, Channel 9 found the same people signing as witnesses for the people voting, which is very rare. 4. In 2016, McCrae Dowless admitted to paying people to obtained signed absentee ballots, which is illegal. If you value independent, accountability journalism, please subscribe to my newsletter. 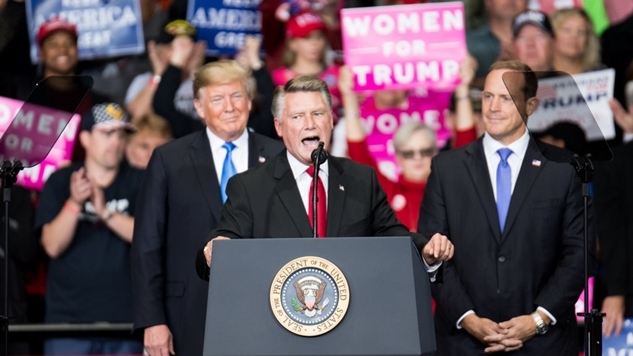 North Carolina has delayed the announcement of a winner in this race (Republican Mark Harris is leading Democrat Dan McCready by about 900 votes) while they investigate this potential election fraud, and they may declare this election void and schedule a new one. If you find yourself shocked by this, consider that in the last decade of Republican rule in North Carolina, the state has gone from an ostensibly normal democratic state to being considered “not a democracy” by the Electoral Integrity Project. In fact, the EIP's score given to North Carolina is similar to authoritarian regimes like Cuba, Indonesia and Sierra Leone. When it comes to the “integrity of voting district boundaries” (read: gerrymandering), no other country in the EIP's history received as low of a score as North Carolina. This is the Republican Party. They lose when everyone votes. Especially anyone who's not a white man. They concentrate all their efforts in ensuring that voting is hard to do, and that creates a culture where the worst actors take standard GOP dogma to its logical end. Unless the Democratic Party puts a robust voting rights and pro-democracy agenda on every single one of their tickets across the country, this will get worse. The 1964 Civil Rights Act shouldn't be viewed as the end of legislation designed to address America's anti-democratic behavior, but the start. With the Republican-controlled Supreme Court blowing a hole in the Voting Rights Act (because Chief Justice John Roberts asserted that the racism which precipitated the bill is no more), in many ways we have returned to a pre-1964 voting rights era. America is moving backwards, which is just how the Republican Party likes it. What happened to the ballots Kinlaw picked up? She gave them to McCrae Dowless. After that, she doesn't know.